The following article. is extracted from Chapter X of William Stirling’s Canon (1897). The work has become increasingly hard to find. The last time I checked it wasn’t available on the internet. However, this material is in the public domain and I’m pleased to rreproduce it here. Stirling writes in a highly condensed manner, managing to pack an amazing amount of profound thoughts into relatively short paragraphs and sentences. This cannot be said for the vast majority of writers towards the end of the 19th Century. There have been enormous logistical challenges in reproducing this text in web format. Chief among these hurdles has been the antiquated fonts,most partucularly in Grreek words and passages. I have made liberal use of screen captures, which in turn are inserted into the body of text. The text remains fully legible and where greek words appear they are replaced by English with negllible loss of meaning. Some of the daigrams have been added where the original was missing or corrupt. 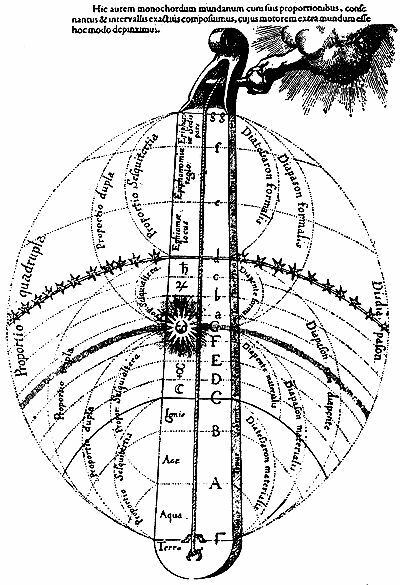 THE theory of ancient music seems to have been constructed from a study of the harmonic relations existing between the parts of the universe; and the musical canon, like that of architecture, was probably based upon certain symmetrical consonances, discovered in the proportions of the planets, and the intervals between their orbits. Yet none of the ancient rules of harmony, which are now intelligible, can be directly or simply traced to the known ratios of the planetary orbits. But all the ancient expositions of the science of music are very obscure, and give the reader the impression that, as in the case of other arts, there is something behind their obvious statements which the writers did not choose to disclose. For instance, Vitruvius (bk. v., ch. 4), after stating that music is an abstruse science, difficult to understand, and requiring many Greek words in its explanation, says, “There are three sorts of modulation, the enharmonic (armonian), the chromatic (crwma), and the diatonic (diatonon), so called by the Greeks.” From the numbers deduced from these Greek words, it may be reasonably assumed that they have been introduced into the text for mystical reasons; for we find Harmonia yields 272, Chroma, 1,541, and Diatonos, 705; and 272 is the width of a vesica 471 long, and 471 is the diameter of a circle having a circumference Of 1,480 (a square whose sides are 471 has a diagonal of 666), and 272 is the diameter of a circle having a circumference of 854, which is the width of a vesica 1,480 long. It may be therefore supposed that the word harmonia implies the number 1,480. Then 1,540 is the length of a vesica 888 long, so that the word chroma may be taken to indicate the number 888. Diatonos, again, has the value of 705, which is in round numbers the side of a square whose diagonals are 999; and a vesica formed of two circles 999 in circumference has a perimeter of 666, which may be supposed to be the number intended to be expressed by this name.We therefore get from the names given to the three kinds of harmony the numbers 2,046, 1,480, and 2,093, as the supposed basis of the harmonic system, and they are, apparently, used here by Vitruvius, as the received canonical measures summarizing the principal dimensions of the universe. The three numbers, 2,368, 1,480, and 888 are in the ratio of 6 : 10 : 16, being divisible by 148. Now, if the sun’s distance be taken at 10, the order of the planets is very nearly in the following proportion: (Mercury) 4, (Venus) 7, (Sun) 10, (Mars) 16, (Jupiter) 52, (Saturn) 97. Therefore the numbers 10 and 16 agree with the ratios of the sun and Mars, while the number 6 falls between Mercury and Venus; that is to say, 2,368 may represent the planet Mars, 1,480 the sun, and 888 the two inner planets Mercury and Venus. Thus the whole three are analogous to the cabalistic triad, according to the Pythagorean theory. For the first person was said to be male, the second person female, and the third person comprised the union of both. Pythagoras sometimes regarded the sun as the central fire of the universe, in which case it may have a feminine sense. These proportions probably formed the harmonic canon of the architects, and it may be concluded that they were known to Vitruvius. The assertion that the planets in their revolutions round the earth uttered certain sounds differing according to their respective “magnitude, celerity and local distance,” was commonly made by the Greeks. Thus Saturn, the farthest planet, was said to give the gravest note, while the moon, which is the nearest, gave the sharpest. “These sounds of the seven planets, and the sphere of the fixed stars, together with that above us, are the nine Muses, and their joint symphony is called Mnemosyne.”Pliny (bk. iii., ch. 22) says, “Saturn moveth by the Doric tone: Mercury by Pthongus, Jupiter by Phrygian and the rest likewise.” The Pythragorean harmony consisted of three concords, called Diapente, Diatessaron, and Diapason. The discovery of these concords is said to have been made by Pythagoras, on hearing the hammers striking the anvil in a blacksmith’s shop. By an experiment he found that the variation of sound was produced according to the weight of the hammer, and he demonstrated his theory thus. The weights of the hammers were respectively, 6, 8, 9, and 12 pounds. He hung these weights upon strings of equal substance and length. When the two strings stretched by the greatest (12), and least (6) weight were struck, they sounded a diapason; the greatest and least but one a diapente, and the greatest, and next greatest sounded a diatessaron. “The diapente proportion was found by Pythagoras to be sesquialtera, the diatessaron sesquiterta, and the diapason or universal concord to be duple.” He made up the octochord by calling the sound produced from the string stretched by the 6 pound weight Hyate, that from the 8 pound weight Mese, that from the 9 Paramese, and that from the 12 pound weight Neate. Pythagoras, using the terms of music, called the interval between the earth and the moon a Tone. He supposed that the distance from the earth to the Zodiac measured seven of these tones, according to the following proportions. But Pliny, who gives us the information, calls this computation of the planetary intervals” a subtiltie more pleasant ywis than needful” (bk. ii., ch. 22). By taking the Tone to be 296, the greatest common measure of the three numbers, 2,368, 1,480, and 886, the distance would be 2,072, or 1 more than 1/12 of the earth’s circumference in miles, and the inner line of the Holy Oblation. Although Vitruvius does not show how the theory of music which he introduces into his treatise is to be applied to architecture, it is certain that some method of harmonic proportion was known to, and practised by, the Greek architects. We are told by Serlio, who wrote in 1537, that there were seven quadrangular proportions generally used in architecture. ” The first figure is a perfect square of four equal sides, and four right angles. The second figure is a sesquiquarta, that is, a square and a quarter (5 : 4). The third figure is a sesquitertia, that is, a square and a third (being of the proportion of 4 : 3, it is the diatessaron). The fourth figure is of the proportion called diagonea, because its length is equal to the diagonal of the square; it is irrational, there being no simple way of finding out this proportion from the fractional part of a square. The fifth figure is called sesquialtera, that is, a square and a half (it is of the proportion of 3 : 2, or diapente). The sixth figure is called superbipartiens tertias, that is a square and two thirds added. The seventh and last figure is called dupla, and is formed of two squares joined to ether” (this is the proportion of 2 : 1, or diapason. Serlio, like Vitruvius, suggests no way of applying these proportions, but it may be, that by taking some number as the measure of the square, a series of proportions are derived, which when distributed throughout a building would give an harmonic result. Thus, if the sides of the square measured 592, and its perimeter 2,368, the six numbers produced according to the above ratios would be 640, 789 1/3, 833, 888, 996 2/3, and 1084. Another series of harmonic proportions may be derived from the divisions of a circle, divided according to the figure given by Cesariano (Vitruvius, p. 11). Nearly all the old philosophers devised a harmonic theory with respect to the universe, and the practice continued till the old mode of philosophizing died out. Kepler (1596), in order to demonstrate the Platonic doctrine, that the universe was formed of the five regular solids, pro posed the following rule. “The earth is a circle, the measurer of all. Round it describe a dodecahedron; the circle enclosing this will be Mars. Round Mars describe a tetrahedron; the sphere enclosing this will be Jupiter. Describe a cube round Jupiter; the sphere containing this will be Saturn. Now inscribe in the earth an icosohedron; the circle inscribed in it will be Venus. Inscribe an octohedron in Venus; the circle inscribed in it will be Mercury” (“Mysterium Cosmographicum,” 1596). This rule cannot be taken seriously as a real statement of the proportions of the cosmos, for it bears no real resemblance to the ratios published by Copernicus in the beginning of the sixteenth century. Yet Kepler was very proud of his formula, and said he valued it more than the Electorate of Saxony. It was also approved by those two eminent authorities, Tycho and Galileo, who evidently understood it. Kepler himself never gives the least hint of how his precious rule is to be interpreted. The subjoined explanation is submitted as a possible solution of its meaning. The earth, he says, is the mensor, or measurer of all, therefore everything depends upon the first step. The diameter of the earth is taken to be 660, that is, 7,920/12; and instead of taking the five figures as 12 solids, they are assumed to be so many regular plane polygons of 4, 6, 8, 12, and 20 sides respectively. The construction of the figure is consequently extremely easy. The twelve-sided figure enclosing the earth is contained by a circle 684 2/5, in diameter, whose circumference is 2,151. This is the circle of Mars. The square described round Mars is enclosed by a circle with a radius of 488, and a circumference of 3,067; this is the circle of Jupiter. The hexagon described round Jupiter is enclosed by a circle whose diameter is 1,120; and this is the circle of Saturn. The twenty-sided polygon inscribed within the earth contains a circle with a diameter of 651, and a circumference of 2,046; this is the circle of Venus. The octagon inscribed within Venus contains a circle whose diameter is 596; this is the circle of Mercury. It will be seen at once that the relative proportions of these circles have no agreement with the orbits of the planets whose names they bear; but every circle, either in its diameter or circumference, represents a cosmic measure. The circle of Mars has a circumference of 2,151; and according to Plato’s distribution of the five solids in the “Timaeus,” the dodecahedron represents the Zodiac; and 2,151 being the number of years in the great month, this may properly symbolize the Zodiacal circle. A hexagon described round this circle has a perimeter of 2,368. The radius of the circle called Jupiter is 488, the square root of the moon’s distance from the earth in miles; the circumference of the same circle is the perimeter of the square which incloses the sun’s orbit measured by the tone, and is inclosed by a rhombus inscribed within the Holy Oblation. The circle assigned to Saturn has a diameter of 1,120, which is the height of a rood cross which crucifies a man contained in a square having a perimeter equal to the side of the Holy Oblation. The circumference of the circle of Venus is equal to the diameter of Saturn’s orbit, measured by the sun’s diameter. The circle called Mercury has a diameter of 596, which is the circumference of Saturn’s orbit if the sun’s distance be taken at 10, and it may be taken for 592, the side of a square having a perimeter of 2,368. In Kepler’s figure in the “Harmonices Mundi,” he allows three lines to each circle, which seems to imply that a certain latitude is to be allowed in the geometry. Probably, therefore, this mystical diagram symbolically reveals the astronomical measures secretly applied to theology, and seems to be intended to illustrate the harmony which was supposed to exist between the sun, the fixed stars, and the intervening planets, likened, by Kepler, to the Father, the Son, and the Holy Ghost. It seems to exemplify Kepler s attitude to all astronomical problems, and to be a result of the old searching after symmetry and harmony in the order of the heavens. For the three laws formulated by him could only have been discovered by a mind intent upon finding harmonic relations of this kind. And he evidently devoted his life to this search. It was music and philosophy which really interested Kepler, rather than the patient and careful observation of nature which occupied his friend Tycho. And although he used Tycho’s observations he never seriously pursued any of these natural inquiries as an end, but rather, like the ancients, he tried to use them as a means to artistic expression. He stands as one of the last astronomers of the old type, and gives us a valuable insight into the practice of the earlier school, who combined astronomy with the doctrines of philosophy. The number 45, deduced from this square, is in round numbers the square root of Saturn’s orbit. And if the numbers of the square be read from right to left in the three rows, we get 294, 753, and 6 18, all of which are mystical numbers, already discussed. 294 is the numerical equivalent for Ecclesia, the Church, 753 is the diameter of a circle whose circumference is 2,368, and 6 1 8 is the numerical equivalent of IHL, etc. By reading it perpendicularly other numbers are obtained, which have also mystical meanings. The number of circles in the universe, counting from the earth to the empyreum is 15. The number 34 is the square root of 1,156, the width of a vesica 2,004 long, while 136.9 is the side of a square inscribed within the Holy Oblation taking the sun’s distance at 10; it is therefore equivalent to the number 1,480. The numbers 5, 25, 65, and 325 are all discussed in the course of this work, and the meanings attributed to them are found in some of the attributes of the planet Mars. “The fourth tablet is of the sun, and is made of a square of 6, and contains 36 numbers, whereof 6 on every side and diameter, produce 111, and the sum of all is 666. . . . This being engraven on a golden plate, renders him who wears it renowned and amiable, and equals a man to kings and princes . . . but with an unfortunate sun it makes a tyrant”. The numbers of this square are all curiously appropriate to the sun, whose ark has been shown to measure 666 of its diameters. Again, 666 is the diameter of a circle 2,093 in circumference, and 2,093 is 9 1/2 times the diameter of the sun’s orbit as well as the diameter of the circle containing the square whose sides are 1,480, – the measure of the body of Christos. “The fifth table is of Venus, consisting of a square of 7 drawn into itself, namely, Of 49 numbers, whereof 7 on each side and diameter make 175, and the sum of all is 1,225. This being engraven on a silver plate, Venus being fortunate procureth concord and love, and endeth strife, . . . and conduceth to the cure of all melancholy distempers. In round numbers 49 is the square root of 2,368. And 1,225 is the measure of a cross whose limbs are 612 1/2 long. The numbers produced by this square are perhaps the most remarkable of the seven, and this seems to be suggested by the comment of Cornelius Agrippa. The number 2,080, thus associated with Hermes, connects this god with the Holy Oblation and confirms the opinion of the Gnostics, that he was identical with Christos. The number 64 is the numerical equivalent of the word Aletheia, Truth. And 260 is, besides being to times 26, the diameter of a circle whose area is equal to that of a square whose sides are 231. The moon was the accepted symbol of the sublunary world, containing the four elements, and the four elements were attributed to the body of the Logos. Now, 81 x 9 1/2 = 769, and 769 is the length of the transverse beam of a cross whose extreme measure is 2,368. Again, 369 is I less than 370, the side of a square whose perimeter is 1,480 (“Occult Philosophy,” bk. ii., ch. 22). arranged so as to read “Sator Arepo Tenet Opera Rotas,” which has the look of a Latin epigram, but it is apparently untranslatable. We know that the priests sometimes converted Roman letters into Greek, so as to obtain numbers from them, as for instance in the “Oedipus Egyptiacus” (tom. ii., par. i., p. 219), where various Latin words are written 1n Greek letters which bring out the number 666. If we give the letters of this seal the value of their Greek equivalents, we get 25 numbers, which may be read in various ways. The five letters on the four sides of the square form the word Sator, the “Sower,” or backwards “Rotas,” wheels. This word, written in Greek letters, has the numerical value of 671, the number of Thora, the Hebrew Bride, and o kosmoV = 670. Then the sum of the numbers forming the perimeter of the square is 2,084, or the length of the side of the Holy Oblation. The two middle rows of letters make up the word “Tenet,” read vertically and horizontally, and the numerical value of this word written in Greek letters is 66o, or the number of miles in the diameter of the earth divided by 12. The number five had a peculiar significance to the Pythagoreans and Christian Cabalists. The Greeks are said to have regarded the pentalpha as the symbol of the Microcosm, and to have written the word ‘Ugiea, 419 (Health), at its five points. Caramuel, in a curious work on architecture (1678), gives the figure of a pentalpha, which not only has the letters of the word Hygeia written round the pentagon at its centre, but also the word Jesus. Now, if a pentalpha be inscribed within the Holy Oblation, the perimeter of the pentagon at its centre measures 2,368. And a pentalpha whose sides measure 418 3/5, a fraction less than the numerical equivalent of Hygeia, has a perimeter of (418 3/5 x 5 =) 2,093, the side of the Holy Oblation containing the crucified body of CHRISTOS. FIG. 23. – PENTALPHA FROM C. AGRIPPA’S “OCCULT PHILOSOPHY,” BK. III., CH. 31. And 419 is the diagonal of a square whose sides are 296, the greatest common measure of the three numbers 888, 1,480, and 2,368. And a pentalpha whose sides are 296 has a perimeter of 1,480. The mystic word ABRACADABRA was said to have great power as a charm. Kircher derives it from Abraxas, 365. According to the Greek valuation of the letters it has the value Of 216, the diameter of the sun’s orbit measured by its own diameter. When written in the form of a triangle, each side having 11 letters, the numerical equivalent of the 3 sides is 443 (216 + 216 + 11), the number of the name o LogoV. The sum of all the letters arranged thus is 1,197, which is the length of a vesica 691 broad, and 691 is the length of the sun’s orbit (220 x 3 1/7 = 691). The number 1,197 is also the circumference of a circle having a diameter of 381, the width of a vesica whose length is equal to of the earth’s diameter. By counting the letters according to the Hebrew valuations, ABRACADABRA yields the number 40, which is the side of Ezekiel’s city, and the length of a rhombus 240 wide. A cross drawn within this rhombus measures 656, the numerical equivalent of the name Messias. 1. Segments from William Stirling: The Canon – An Exposition of the Pagan Mystery Perpetuated in the Cabala as the Rule of All the Arts Images not numbered have been added by myself, with the intent of elucidating the topics discussed.